Mother Goose Time does an amazing job of offering up challenges that inspire my kids. Some of these challenges are completed independently and others encourage them to work together. These transportation themed math exercises were big winners in our house! This activity is a great pre-literacy review of lines and curves that can be used to create letters and numbers. Pattern recognition and spatial awareness are also reinforced. *These materials included with Mother Goose Time preschool curriculum. Place the Map Cards on the table with the Loose Letter Parts and Vehicle Counters. Encourage children to use the Loose Letter Parts to recreate the roads on the Map Cards, then place the vehicles on their roads. Invite children to create their own 3D roads and vehicles, then draw a picture of their map. Did the children flip. rotate and arrange the loose parts to create a 3D replica of the 2D map? Did he try to create his own 2D-3D map? My three children each enjoyed this activity at their own level. My oldest child (kindergartner) recreated the sample maps as pictured. She arranged the loose parts in the same direction and orientation as shown on the map cards. She also placed the vehicles of identical kind and color on the exact places shown on the map cards. My preschooler happily recreated a few of the maps, but with less attention to specific detail. He was content to mimic the map cards to the extent that the end result was usable in free play. For example, he created an on-ramp for cars, a runway for airplanes, and a “docking station” for boats. My toddler was unconcerned with the map cards. He happily worked alongside me creating one of the simpler maps, but quickly turned his attention to playing with the transportation venues his older brother had created. Since, he loves using these small vehicles for play, we returned to this activity later in the day and created a multi-type of vehicular parking lot and sorted by type, color, and number. What a joy to watch these kids build skills that they will use for the rest of their lives! This activity provides templates that kids can use to create bridges made from paper or cardboard and blocks. Discussing, designing, and implementing their own block bridges is also encouraged. Be sure to test out the strength of the bridge design with a few vehicles, i.e. light weight math counters. Ours are compliments of Mother Goose Time’s Transportation Station thematic preschool program. What do you think would happen if a bridge broke? Invite children to role-play their ideas. Explain that bridges must be built strong enough to hold heavy weight and to survive earthquakes, strong winds, and extreme temperatures. Encourage children to work together to recreate the bridge designs included on the Bridge Construction Photos. Invite children to predict how many Vehicle Counters the bridge can hold. Which bridge held the most weight? 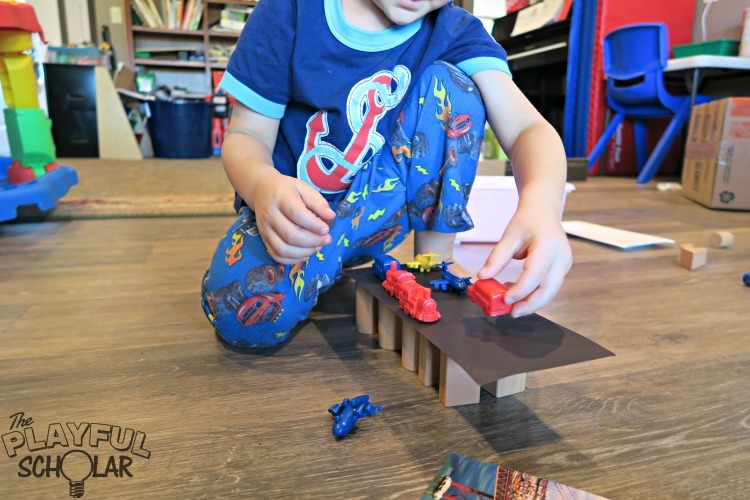 Simplify – Encourage the child to copy the simplest bridge design. Challenge – Invite children to design a bridge that holds ten vehicle counters. What problem-solving strategies did the child use when building the bridges? Did he help others build a bridge? At first the kids were doubtful that they would be able to create a bridge using the paper provided and blocks. So, convinced were they that the paper wouldn’t be strong enough that they demonstrated a vehicle weighing the paper down and requested cardboard. I gave them cardboard with the caveat that once they built some bridges with the cardboard they would also try the paper. Using cardboard worked very well and the kids built a very long bridge. Initially, they were much more interested in seeing how long they could make their own bridge rather than using the suggested designs. Then they tried using the black paper and quickly found that some of the design strategies that worked with the cardboard didn’t work with the paper. At first this was frustrating, but then they decided to try some of the suggestions for bridge construction that were provided by Mother Goose Time. They were thrilled with their successes. The one design that alluded them was the design that used an additional sheet of paper as a middle support. The paper kept sliding on our floor and wouldn’t stay in place for them. Finally my boys worked together to solve this problem by stacking blocks at either end to hold the curved sheet in place. The bridge was then able to hold vehicles. The boys were thrilled and I loved watching them work together to solve an enjoyable, low stress, learning filled challenge! I hope you’ll enjoy these transportation themed, math activities with your kids! If you are interested in reading more about our experience with Mother Goose Time, check out our curriculum page! If you love finding new fun ideas for games and crafts for early childhood be sure to follow us on Instagram!